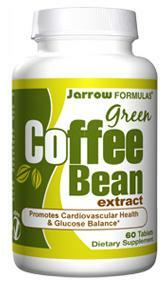 Green Coffee Bean Extract for Safe Weight Loss and Blood Sugar Control! Move over green tea, green coffee bean extract is the newest nutritional phenomenon! This new compound can help you lose weight, control blood sugar and reduce your risk of chronic disease! Pretty impressive for a nutritional newcomer! This is the latest nutritional wonder and it actually took me by surprise! We are all familiar with green tea, but now green coffee is the talk of the supplement world, and for good reason, it can help with controlling blood sugar, and that is key for living a long healthy lifespan! Green coffee bean extract contains a compound called chlorogenic acid, which is present in green coffee beans prior to ripening and turning red. The key to it's benefits is that it is harvested before the beans ripen, thereby maximizing the amount of chlorogenic acid in the beans. Chlorogenic acid is a member of a family of naturally occurring organic compounds, which are esters of polyphenolic caffeic acid and cyclitol (-)-quinic acid. This compound, has long been identified an antioxidant, and also has the ability to slow the release of sugar (glucose) into the bloodstream following a mean. This ability to slow sugar entering the bloodstream diminishes the severity of what we call the “glucose spikes,” which can elevate your insulin levels and increase the inflammation in your arteries. Every time you eat, your blood glucose can spike and cause this insulin release. Since insulin is a very PRO-inflammatory hormone, anything you can do to blunt or suppress this glucose spike is beneficial to your health. The ability of green coffee bean extract to assist with healthy weight loss has amazed many people in the medical field. A recent study published in the Diabetes, Metabolic Syndrome and Obesity journal showed impressive weight loss results with this compound. In this study, 16 adults were given green coffee bean extract and lost an average of 17 pounds over a 12 week period! Amazingly, there were NO reported side effects! The weight loss effect did not result from caffeine, but rather from the ability of the compound to prevent glucose spikes and increase fat burning in the liver. The amazing thing was that this weight loss effect worked without exercise or changes to their diets. Although this may sound like it goes contrary to sound medical advice about the importance of proper diet and exercise, it DOES show how important minimizing “insulin” in your efforts to lose weight safely by burning fat. It is safe to say that if the study subjects added exercise and a better diet to the effects of the green coffee extract, their results would have been even MORE impressive! The green coffee extract was given to the people in the study in the form of 400mg capsules. This is because if you actually made coffee from the green coffee beans, it would be too bitter to drink. You can't get the same effect from regular coffee because roasting the coffee beans destroys the chlorogenic acid that provides the weigh loss effect. The results of the study suggest that the 400mg strength of green coffee extract works best. One to two capsules taken with 8 ounces of water about 30 minutes before a heavy meal should work well for most people. Those of you who are sensitive to caffeine should be ok with this compound as it contains very little, about 12-20 milligrams of caffeine per serving. Never the less, if you have a heart condition, or are on any medications, DO consult with your doctor before taking this supplement, so as not to run into any problems with interactions between your medications and the green coffee extract. Green coffee bean extract is one of the most promising new nutraceuticals to come along in many years. It offers safe weight loss, AND help in controlling damaging glucose spikes, even for people who are sedentary and don't have pristine diets. It absolutely works MUCH BETTER if you have a clean diet and you exercise as well, so try to do all of these things and use this supplement to compliment your other antiaging efforts!